This is a spoiler-free review of Netflix's The Umbrella Academy, which is now streaming globally on Netflix. Move over, Marvel – Netflix has a new superhero franchise, and if anything, it's even more than twisted, bloody, and unpredictable than the street-level adventures of The Defenders. 1; aside from their comic book origins, the shows are attempting to do very different things; The Umbrella Academy focuses on a dysfunctional family of heroes, who are drawn together at an eccentric and emotionally distant billionaire and tasked with saving the world from annihilation (with a healthy dose of time travel, dancing, and talking chimpanzee thrown in). 19659004] In that way, it has much more in common with DC's Doom Patrol (a comic that creator Gerard Way has long cited as an inspiration for his own team of misfits, and even previously wrote for), which is why it's both ironic and Strictly poetic that Netflix is ​​launching the series on the same day DC Universe is debuting its decidedly NSFW adaptation of Doom Patrol (check out our premiere review here), based heavily on the Grant Morrison run or comics that also inspired Way's writing. 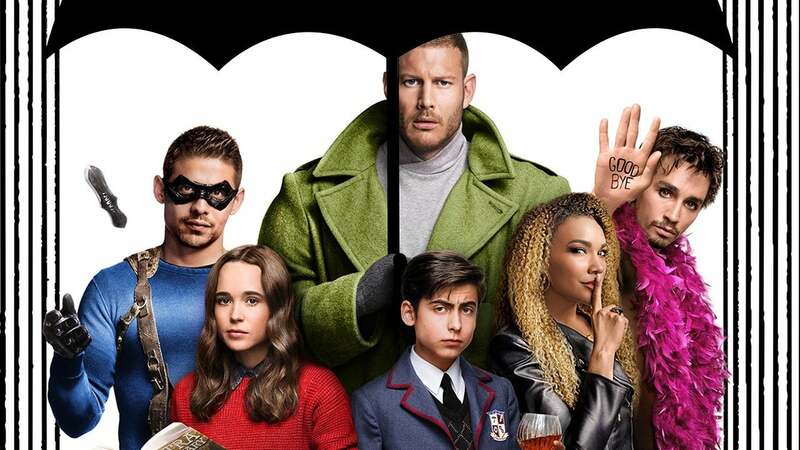 Basically, 2019 is an embarrassment of riches for comic book fans – The Umbrella Academy and Doom Patrol are two of the best superhero shows in recent years, blending self-aware humor with stylish storytelling as a way to deconstruct an already overpopulated genre. Plus, their different delivery methods (DC is debuting new episodes of Doom Patrol weekly, as opposed to Netflix's binge model) ensure that we'll have plenty of time to compare their approaches as they carve out a very different niche from Marvel's streaming shows. But the true revelation of the show is Aidan Gallagher as Number Five, a crotchety time-traveler who has lived in old age after getting stuck in the future but is now trapped in his teenage form, and has witnessed the impending apocalypse firsthand. Five's return (and his warning about the end of the world) is the catalyst for much of the story, and Gallagher strikes the perfect balance of worldly and world-weary without ever seeming precocious. After a couple of episodes, you are convinced that the 15-year-old really is a grumpy old man in a kid's body and his snark – especially in combination with Sheehan's gleeful lunacy – is the highlight of the series. While the show is a fairly faithful, if streamlined, adaptation of Way and Gabriel Bá's comics (with a few pivot deviations), the interplay between the siblings is even more compelling than the mystery at its core, and you'll probably have more fun trying to figure out the various rifts, rivalries, and connections that have forged and fractured this team than you will attempt to decipher all the clues that are leading towards the apocalypse. Diego (David Castañeda), aka Number 2, is a prickly payer who has spent his life trying to step out of Luther's shadow, but the deep wounds he carries from a lifetime of playing second fiddle for a surprisingly poignant character arc. Likewise, Emmy Raver-Lampman's Allison (Number 3) is the only member of the family who seems to be trying to learn from her past mistakes, and her connections with both Luther and Vanya give the season much of its heart. Tonally, Umbrella Academy isn't quite as meta as the likes of Deadpool or Doom Patrol, but its wicked sense of humor is in full effect throughout, giving it a playful and sometimes deliciously sick attitude, with a smattering of gory visual gags. The season does lose momentum around the midway point, however – a flaw that tends to trip up Netflix dramas – and occasionally feels as if the show is spinning a few too many plates, especially in the storyline involving Number Five and the two time traveling assassins on his tail, Hazel (Mindhunter's Cameron Britton, once again stealing every scene he's in) and Cha-Cha (a badass Mary J. Blige). Other supporting characters, such as a hapless cop, Detective Patch (Ashley Madekwe), and Vanya's love interest, Leonard (John Magaro), feel a little half-baked, designed more to move the plot forward than as organic parts of the narrative. The Umbrella Academy should comfortably fill the void that Netflix's Marvel cancellations have left in our viewing schedules. (Okay, we're still not talking about Daredevil, but the other two, at least.) Showrunner Steve Blackman has created a hilariously twisted, subversively stylish, and surprisingly poignant new superhero series that serves as both a witty deconstruction of our favorite comic book tropes and an ambitious, time-bending trunk. Despite some bloat around the midseason mark and a few underdeveloped supporting characters, this is an undeniably super new series.